This PakBoats spray deck is from a recently discovered outfitter's hoard. Spray Deck is new, but shop worn. Expect some dust, stains and minor cosmetic damage. Satisfaction is guaranteed. Made for the Puffin II, foot folding kayak, for use while solo paddling. Spray deck is approximately 13 feet 4 inches long by 27 inches wide, made of gray 150 denier PVC coated polyester with black trim. Information on this part is sparse. This spray deck may fit other Pakboats, possibly the Arrow kayak. Original Arrow decks are red or yellow with black trim. The spray deck attaches to the hull with a Velcro strip sewn all the way around the edge, mates with Velcro on the gunwales of boat. The single cockpit hole is located in the center of the deck, it is 29 inches long by 22 inches wide, with an aluminum frame, as the coaming, covered in fabric. It can be used with an optional PakBoats Puffin spray skirt. The cockpit coaming folds in half for packing. 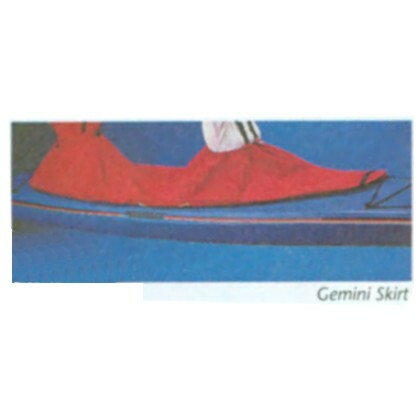 The deck is supported by flexible fiberglass rods NOT included with this cover! 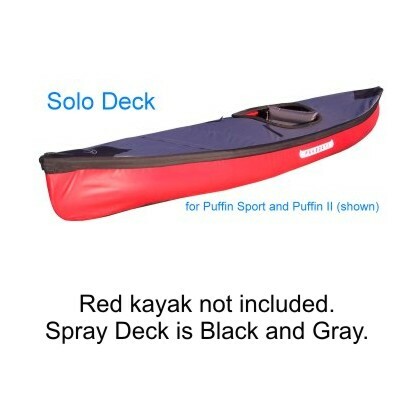 Photo shows this deck on a kayak. The boat is not included. Spray Deck is Shop Worn. Expect some dust, stains and minor cosmetic damage. Satisfaction is guaranteed!